A malicious and fake email designed to create communal tension is circulating on social media 48-hours before Karnataka votes. 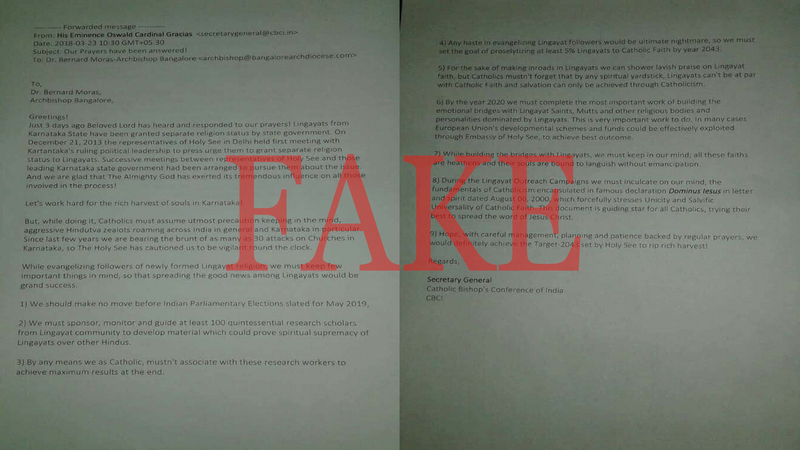 Barely 48 hours ahead of voting in the assembly elections in Karnataka, a fake email purported to be from the Catholic Bishops’ Conference of India to Bangalore’s archbishop asking him to convert Lingayats in the state to Catholicism, has gone viral on social media and WhatsApp. 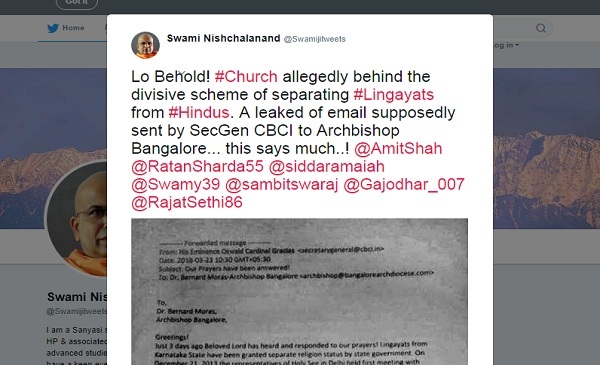 The fake email claims that on December 21, 2013 representatives of the Holy See (the Pope) in Delhi held their first meeting with Karnataka’s ruling political leadership to convince them to grant a separate religion status to Lingayats. The email alleges that since then, subsequent meetings have taken place with the state government to convince them on the issue. The fake email also lists nine diabolical steps to go about converting Lingayats to Catholicism. These include sponsoring 100 Lingayat scholars to develop material which could prove “spiritual supremacy of Lingayats over other Hindus.” The fake email also lists a goal of evangelizing at least 5% of Lingayats by 2043 and by 2020 building “emotional bridges” with Lingayat saints and Mutts. This can be achieved through European Union’s developmental schemes and through funds exploited through the “Embassy of the Holy See”, the fake email claims. His tweet was shared by Subramanian Swamy’s verified Facebook page. I know their conversion propaganda very well.. They are trying everything to convert hindus into Christianity. The email spins a convenient narrative and gives unnecessary background for a supposedly internal mail between bishops who are alleged to be co-conspirators. The email stands out as peculiar because of the way it reads. Skipping articles such as ‘the’ in several places suggesting it was written by a non-native speaker of English. The reference of “harvesting of souls” is almost exclusively used as a sarcastic and derogatory reference by the Hindutva right-wing while speaking about so called forced religious conversions in India. The word ‘reap’ has been misspelt as ‘rip’. 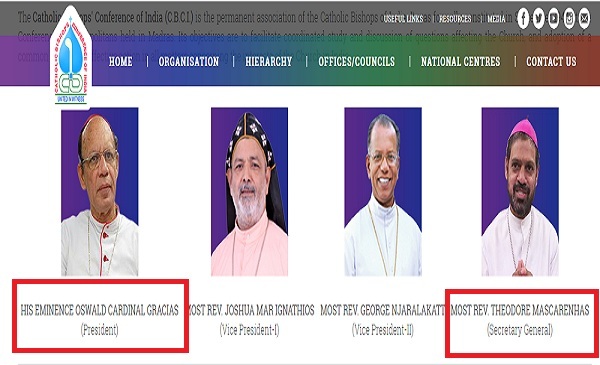 Even the apostrophe in the name of the organisation (Catholic Bishops’ Conference of India) has been placed incorrectly. Furthermore, the email was purported to be sent by His Eminence Oswald Cardinal Gracias to Dr. Bernard Moras, Archbishop of Bangalore. 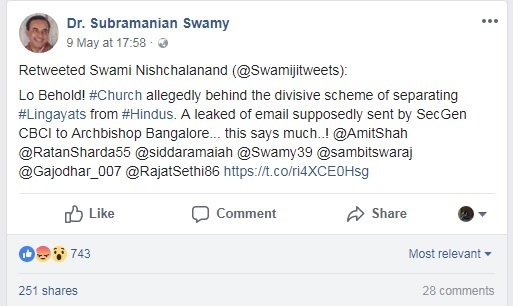 However, the signatory of the email is supposedly the ‘Secretary General’ whereas Oswald Gracias is the president of the Catholic Bishops’ Conference of India. 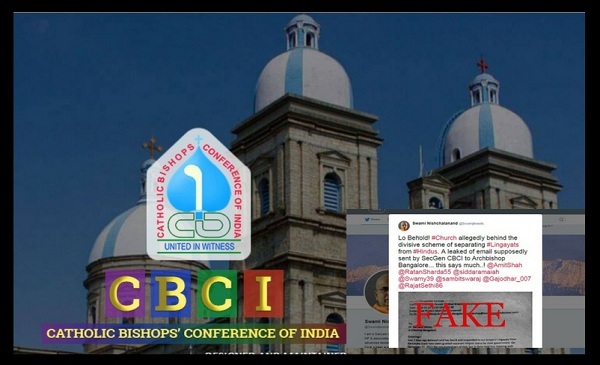 In a strongly-worded clarification, the Catholic Bishops’ Conference of India called the email a fake and said that it reserved the right to take legal action against those involved in making and promoting the letter. The letter signed by Bishop Theodore Mascarenhas, the actual secretary general of the religious organisation also questioned the timing of the letter on the eve of elections in Karnataka and called the document a “disgraceful mischievous ploy”. “The Catholic Bishops’ Conference of India nor Cardinal Gracias will never ever indulge in divisive tactics as indicated in that letter. The language mistakes in that letter point out that it could not have originated from our Office.” – Bishop Theodore Mascarenhas, Secretary General, Catholic Bishops’ Conference of India. The issue of granting a separate religious identity to the numerically significant and politically decisive community has become a hot potato in poll-bound Karnataka.